The most exciting part in writing this family history blog is hearing from someone with "The Rest of the Story" . Only a few hours after posting the piece about Peter Deans Rae, I was contacted by Pat, the Google user Pamaga who started my quest from Gateshead in the UK. She tells me that Pete was a cousin to her grandfather and she knew him to be a lovely, quiet, unassuming man who had quite a resemblance to her grandfather. 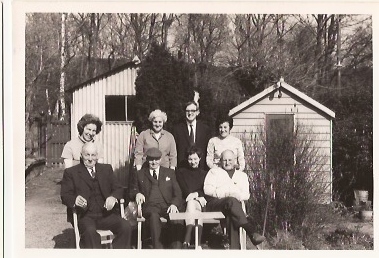 Her family photos taken overseas show her grandfather on the left in the front row and Pete beside him. 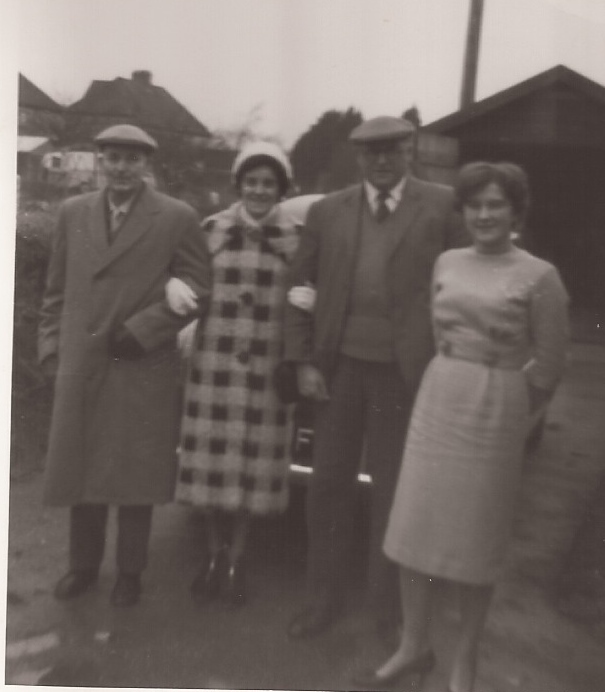 The four standing left-right are Pete, her Aunt Maisie, her Dad, and Pat in about 1961. 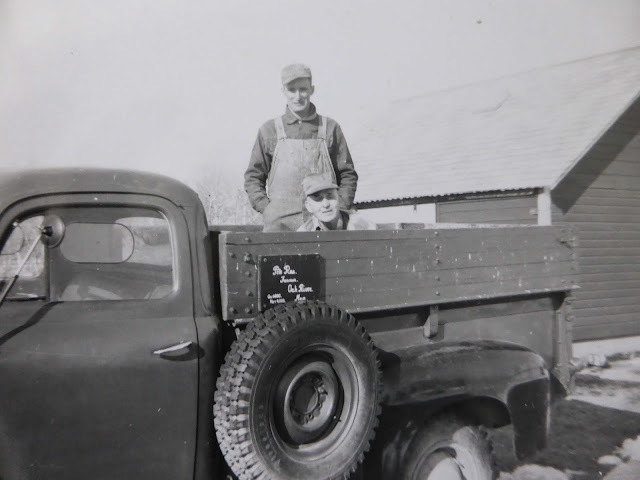 The other picture Pat sent me below is of Pete in the back of his truck box in Canada with Doyle Baily standing behind. Doyle bought Pete's farm in 1961 and continues to own it today and live on the next quarter to it where he and his wife Lynda raised a family of 2 girls. The sign on the truck box with the words "Oak River, Man" were what led Pat to my blog post in the first place! At the tender age of 17 in 1910, Pete left Galashiels, Scotland and came to Canada. He worked for Eaton's in Winnipeg and then went farther west to Blanshard Municipality to work for various farmers until beginning to farm for himself. He returned for a visit to Scotland in 1921 and must have then convinced his mother Elizabeth to join him and keep house for him. She stayed in Canada for the rest of her days and died on May 11, 1952 and is buried in Oak River Cemetery. In 1946 Pete bought the north half of section 31 range 14 township 22, pictured in the previous post. My mom found his name on a list of annual yearly canvas donors for the Oak River United Church in 1957. In the late 50's they were also raising money for a new church organ and he likely contributed to that cause along with much of the community. The organ was purchased and later moved to the new church when it opened in 1964 and still sees occasional use. Pete retired to Scotland in 1961 but was no doubt fondly remembered across the pond by the people and the community where he spent his working life. Thank you, Pat for introducing him to me as well. Thank you so much, Sharon, for this additional information. Pete and Jim had a sister, Agnes Douglas Rae, too. I believe she remained in the UK but I may be wrong as I had no idea that Pete's Mum moved out there! By the way, I was interest to see one of your family names was Kinnaird. My husband's ancestors were Kinnears, a variation of the name, and came originally from Buckhaven, Fife, where they were fisher folk The moved down to North Shields and continued their fishing occupation there.